The DIONIC® HCX is the latest addition to our high current product line. 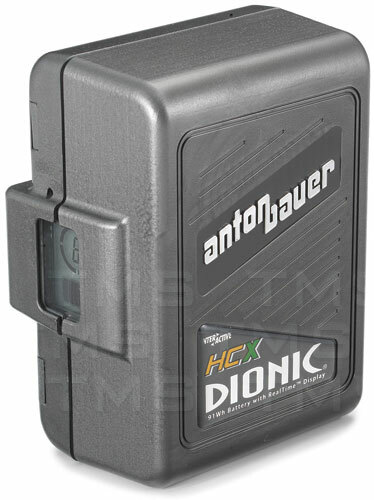 With a 124 watt-hour capacity and the ability to sustain a 10 amp draw, the DIONIC HCX will run a 40 watt camera with a 20 watt light for 2 hours. The motion detection feature incorporates a “deep sleep” setting that reduces battery self-discharge, allowing for extended periods of storage with minimal capacity loss. The battery may be “awakened” by the built in motion sensor. To provide precise run-time data, an enhanced RealTime LCD fuel gauge has been incorporated to display up to nine hours of run-time (under low power load conditions) using a seven-segment display enclosed by four circular arcs that indicate 15-minute time intervals.